Moon is a 2009 science fiction film directed by Duncan Jones and written by Nathan Parker from a story by Jones. The film follows Sam Bell (Sam Rockwell), a man who experiences a personal crisis as he nears the end of a three-year solitary stint mining helium-3 on the far side of the Moon. 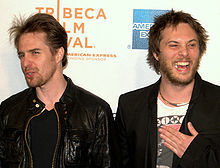 It was the feature debut of director Duncan Jones. Kevin Spacey voices Sam's robot companion, GERTY. Moon premiered at the 2009 Sundance Film Festival and was released in selected cinemas in New York and Los Angeles on 12 June 2009. The release was expanded to additional theatres in the United States on 10 July and to the United Kingdom on 17 July. Moon was modestly budgeted and grossed just under $10 million worldwide but was well-received by critics. Rockwell's performance found praise as did the film's scientific realism and plausibility. It won numerous film critic and film festival awards and was nominated for the BAFTA Award for Best British Film. In the near future,[a] Lunar Industries has made a fortune after an oil crisis by building Sarang Station, a facility on the far side of the Moon to mine the alternative fuel helium-3 from lunar soil, rich in the material. The facility is highly automated, requiring only a single human to maintain operations, oversee the harvesters, and launch canisters bound for Earth containing the extracted helium-3. Sam Bell nears the end of his three-year work contract at Sarang Station. Chronic communication problems have disabled his live feed from Earth and limit him to occasional recorded messages from his wife Tess, who was pregnant with their daughter Eve when he left. His only companion is an artificial intelligence named GERTY, who assists with the base's automation and provides comfort for him. Two weeks before his return to Earth, Sam begins to suffer from hallucinations of a teenage girl & a bearded, dishevelled man. One such image distracts him while out recovering a helium-3 canister from a harvester, causing him to crash his lunar rover into the harvester. Rapidly losing cabin air from the crash, Sam falls unconscious. Sam awakes in the base infirmary with no memory of the accident. He overhears GERTY having what appears to be a live chat with Lunar Industries management. Lunar Industries then orders Sam to remain on base and informs him that a rescue team will arrive to repair the harvester. Suspicious, Sam manufactures a fake problem to persuade GERTY to let him outside. He travels to the crashed rover, where he finds his unconscious doppelgänger. He brings the double back to the base and tends to his injuries. The two Sams start to wonder if one is a clone of the other. After a heated argument and physical altercation, GERTY reveals that they are both clones of the original Sam Bell. GERTY activated the newest clone after the rover crash, and convinced him that he was at the beginning of his three-year contract. GERTY confirms his memories of his wife & daughter are implanted. The two Sams search the area finding a communications substation beyond the facility's perimeter which has been interfering with the live feed from Earth. Later the older Sam discovers a secret vault containing hundreds of hibernating clones. They determine that Lunar Industries is unethically using clones of the original Sam Bell to avoid the cost of training and transporting new astronauts, as well as deliberately jamming the live feed in order to prevent the clones from contacting Earth; clones who believe they're entering the final hibernation at the end of their contract just before their final return to Earth are in fact incinerated. The older Sam clone drives past the interference radius in a second rover and tries to call Tess on Earth. He instead makes contact with Eve, now 15 years old, who says Tess died "some years ago". He hangs up when Eve tells her father (offscreen, identified as "Original Sam" in closed captioning) that someone is calling regarding Tess. At the same time, GERTY helps the older Sam access the recorded logs of past Sam clones, showing them all falling ill as their contract expires and revealing that the clones are designed to "break down". At the same time, the older Sam has begun displaying the same symptoms as the clones as they began to break down. The two Sams realise that the incoming rescue team will kill them both if they are found together. The newer Sam convinces GERTY to wake another clone, planning to leave the awakened clone in the crashed rover and send the older Sam to Earth in one of the helium-3 transports. But the older Sam, having learned that the clones are designed to "break down" at the end of the 3-year contract, knows that he will not live much longer. With his health rapidly declining, the older Sam suggests that he be placed back into the crashed rover to die so Lunar Industries will not suspect anything, while the newer Sam escapes instead. Following GERTY's advice, the newer Sam reboots GERTY to wipe its records of the events. Before leaving, the newer clone reprograms a harvester to crash and wreck the jamming antenna, thereby enabling live communications with Earth; he also brings along a canister of helium-3 to provide him with funds once he reaches Earth. The older Sam, back in the crippled rover, remains conscious long enough to watch the launch of the transport carrying the newer Sam to Earth. The rescue team is successfully fooled after finding both a newly awakened clone in the medical bay and the corpse of the older Sam inside the crashed rover. The helium transport arrives at Earth, and over the film's credits, news reports describe how Sam's testimony on Lunar Industries' activities has stirred up an enormous controversy, and the company's unethical practices have plummeted the company's stock. This is the first feature film directed by commercial director Duncan Jones, who co-wrote the script with Nathan Parker. The film was specifically written as a vehicle for actor Sam Rockwell. Rockwell almost turned the film down and Paddy Considine was an alternate choice. The film pays homage to the films of Jones' youth, such as Silent Running, Alien, and Outland. In an interview with Wired.com, speaking about those films, Jones stated it was his "intent to write for a science fiction-literate audience" and that he "wanted to make a film which would be appreciated by people like myself who loved those films". [We] wanted to create something which felt comfortable within that canon of those science fiction films from the sort of late seventies to early eighties. for me, the Moon has this weird mythic nature to it. ... There is still a mystery to it. As a location, it bridges the gap between science fiction and science fact. We (humankind) have been there. It is something so close and so plausible and yet at the same time, we really don't know that much about it. The director described the lack of romance in the Moon as a location, citing images from the Japanese lunar orbiter SELENE: "It's the desolation and emptiness of it ... it looks like some strange ball of clay in blackness. ... Look at photos and you'll think that they're monochrome. In fact, they're not. There simply are no primary colours." Jones made reference to the photography book Full Moon by Michael Light in designing the look of the film. Moon's budget was $5 million. The director took steps to minimise production costs, such as keeping the cast small and filming in a studio. Moon was produced at Shepperton Studios, in London, where it was filmed in 33 days. Jones preferred using models to digital animation, working with Bill Pearson, the supervising model maker on Alien, to help design the lunar rovers and helium-3 harvesters in the film. The Moon base was created as a full 360-degree set, measuring 85–90 feet (26–27 m) long and approximately 70 feet (21 m) wide. The film's robot, GERTY, was designed to be bound to an overhead rail within the mining base since its mechanical tether was critical to the story's plot. The visual effects were provided by Cinesite, which has sought cut-price deals with independent films. Since Jones had an effects background with TV advertisements, he drew on his experience to create special effects within a small budget. Several parts of the sets, notably the sleeping quarters and the corridor of the "secret room", bear a resemblance to the BBC TV sci-fi comedy Red Dwarf. This is because, to save on set costs, the film re-used sets that had been built for an abandoned Red Dwarf movie. International sales for Moon are handled by the Independent sales company. Sony Pictures Worldwide Acquisitions Group acquired distribution rights to the film for English-speaking territories. Sony Pictures Worldwide Acquisitions Group was considering making Moon a direct-to-DVD release; however, after Moon premiered at the 2009 Sundance Film Festival in January 2009, Sony Pictures Classics decided to handle this film's theatrical release for Sony Pictures Worldwide Acquisitions Group. Sony Pictures Classics distributed the film in the United States in cinemas, beginning with screenings in selected cinemas in New York and Los Angeles on 12 June. The film's British premiere was held on 20 June 2009 at the Cameo Cinema in Edinburgh as part of the 63rd Edinburgh International Film Festival. Jones was present at the screening along with other key crew members. The full UK release was on 17 July. The Australian release was on 8 October. Moon grossed £700,394 from its domestic release, $3,370,366 from its North American release and $9,760,104 worldwide, making the film a modest financial success. Moon was generally well-received by critics. Film review aggregator Rotten Tomatoes reports that 90% of critics gave the film a positive review based on 191 reviews, with an average score of 7.5/10. The site's consensus states: "Boosted by Sam Rockwell's intense performance, Moon is a compelling work of science-fiction, and a promising debut from director Duncan Jones." On Metacritic, which assigns a rating out of 100 based on reviews from critics, the film has a score of 67 based on 29 reviews, considered to be "generally favorable reviews". Damon Wise of The Times praised Jones' "thoughtful" direction and Rockwell's "poignant" performance. Wise wrote of the film's approach to the science fiction genre: "Though it uses impressive sci-fi trappings to tell its story—the fabulous models and moonscapes are recognisably retro yet surprisingly real—this is a film about what it means, and takes, to be human." Duane Byrge of The Hollywood Reporter applauded screenwriter Nathan Parker's "sharp [and] individualistic" dialogue and the way in which Parker combined science fiction and Big Brother themes. Byrge also believed that cinematographer Gary Shaw's work and composer Clint Mansell's music intensified the drama. Byrge wrote: "Nonetheless, 'Moon' is darkened by its own excellencies: The white, claustrophobic look is apt and moody, but a lack of physical action enervates the story thrust." The critic felt mixed about the star's performance, describing him as "adept at limning his character's dissolution" but finding that he did not have "the audacious, dominant edge" for the major confrontation at the end of the film. Moon is a superior example of that threatened genre, hard science-fiction, which is often about the interface between humans and alien intelligence of one kind of or other, including digital. John W. Campbell Jr., the godfather of this genre, would have approved. The movie is really all about ideas. It only seems to be about emotions. How real are our emotions, anyway? How real are we? Someday I will die. This laptop I'm using is patient and can wait. Empire magazine praised Rockwell's performance, including it in '10 Egregious Oscar Snubs—The worthy contenders that the Academy overlooked' feature and referred to his performance as "one ... of the best performances of the year". Rolling Stone magazine ranked the film at number 23 on their Top 40 Sci-Fi Movies of the 21st Century, finding that "Duncan Jones' debut feature keeps you wondering whether its hero - played by an on-point Sam Rockwell - is losing a battle with what appears to be his "double" or if he, is, in fact, losing his mind ... this sci-fi indie does a helluva lot with very, very little". Digital Spy said it was an "incredible low-budget science fiction movie", opining that Jones' direction of the film "brilliantly explores ideas of identity while mixing in some practical VFX spectacle to boot. This is perhaps one of the best sci-fi films of the 21st century". A. O. Scott, chief film critic for The New York Times wrote that Jones directing "demonstrates impressive technical command, infusing a sparse narrative and a small, enclosed space with a surprising density of moods and ideas". Scott said that like most of science fiction, the film "is a meditation on the conflict between the streamlining tendencies of technological progress and the stubborn persistence of feelings and desires that can't be tamed by utilitarian imperatives", while also asserting that "the film's ideas are interesting, but don't feel entirely worked out..the smallness of this movie is decidedly a virtue, but also, in the end, something of a limitation". Moon also received positive reviews at the Sundance Film Festival. Moon was screened as part of a lecture series at NASA's Space Center Houston, at the request of a professor there. "He'd been reading online that we'd done this film about helium-3 mining and that's something that people at NASA are working on", says Jones. "We did a Q&A afterward. They asked me why the base looked so sturdy, like a bunker, and not like the kind of stuff they are designing that they are going to transport with them. I said 'Well, in the future I assume you won't want to continue carrying everything with you, you'll want to use the resources on the moon to build things' and a woman in the audience raised her hand and said, 'I'm actually working on something called mooncrete, which is concrete that mixes lunar regolith and ice water from the Moon's polar caps.'" In the 2013 October issue of the journal Trends in Cognitive Sciences, academics ranked their top brain science movies of all time; their database being compiled by cognitive science researchers who are also movie buffs. The database, called the Cognitive Science Movie Index, ranks films for quality, relevance and accuracy in the field of cognitive science. On their top 10 lists of brain science movies of all time, Moon appears at number 5 on the quality list, number 9 on the accuracy list and number 3 on the relevance list. Jones released a follow-up film, titled Mute, in 2018, which serves as a spiritual successor to Moon. "Sam has agreed to do a little cameo in the next film", said Jones, who ultimately hopes to complete a trilogy of films set in the same fictional universe. It was released on February 23, 2018, as a Netflix exclusive. In the film, on a TV broadcast of a court trial, Sam Bell and several of his clones are all seen in the courtroom, identifying themselves in an "I'm Spartacus" allusion. ^ A computer screen shows a date of 2035 in one scene towards the end. ^ "Moon (2009)". British Board of Film Classification. Retrieved 18 March 2019. ^ a b Spelling, Ian (14 December 2012). "How David Bowie's son wound up making an indie movie about the Moon". SYFY Wire. Retrieved 18 March 2019. ^ a b c "Moon". Box Office Mojo. Retrieved 18 March 2018. ^ a b c Siegel, Tatiana (5 May 2008). "Sony lands 'Moon' rights". Variety. Retrieved 18 March 2019. ^ Dawtrey, Adam (14 January 2009). "U.K. co-productions storm Sundance". Variety. Retrieved 18 March 2019. ^ @manmademoon (30 December 2012). "If Sam R decided last minute not to do the film, & that was a very real possibility, we were seeing if Paddy Considine would do it #Moonbbc2" (Tweet). Retrieved 18 March 2019 – via Twitter. ^ a b "News Etc". Empire. February 2009. pp. 20–21. ^ "Moon Is Duncan Jones' Homage to Classic Sci-Fi". San Francisco: Wired.com. 12 June 2009. Retrieved 18 March 2019. ^ a b c d e Douglas, Edward (23 January 2009). "Sundance EXL: Duncan Jones & Sam Rockwell on Moon". ComingSoon. Retrieved 18 March 2019. ^ Macnab, Geoffrey (23 October 2008). "Moon rising: Two new lunar movies are taking viewers back into orbit". The Independent. London. Retrieved 18 March 2019. ^ a b Scott, A. O. (11 June 2009). "Planet Earth Is Blue and So Very Far Away". The New York Times. Retrieved 18 March 2019. ^ Marshall, Greg (16 January 2009). "Sundance goes sci-fi with 'Moon'". Park Record. Retrieved 18 March 2019. ^ Dawtrey, Adam (7 November 2008). "London's CG houses share digital wealth". Variety. Retrieved 18 March 2019. ^ O'Neill, Phelim (30 August 2009). "Moon's old-school effects should be the model for sci-fi films". The Guardian. Guardian News and Media. Retrieved 18 March 2019. ^ Dawtrey, Adam (11 March 2008). "Independent flies to 'Moon'". Variety. Retrieved 18 March 2019. ^ Goldstein, Gregg (23 January 2009). "10 Days of Sundance: Moon waxes Theatrical With Sony". MCN Blogs. Archived from the original on 16 October 2009. Retrieved 18 March 2019. ^ Swart, Sharon (23 January 2009). "Sony Classics nabs 'Moon'". Variety. Retrieved 18 March 2019. ^ "MOON: A Film by Duncan Jones". Sony Pictures Classics. Archived from the original on 2 February 2013. Retrieved 18 March 2019. ^ Clarke, Cath (28 May 2009). "First sight: Duncan Jones". The Guardian. London. Retrieved 18 March 2019. ^ Stratton, David. "At the Movies: Moon". ABC. Archived from the original on 11 May 2016. Retrieved 5 November 2009. ^ "Moon". www.screenrush.co.uk. Archived from the original on 22 August 2012. Retrieved 18 March 2019. ^ "Moon (2009)". Rotten Tomatoes. Fandango Media. Retrieved 18 March 2019. ^ "Moon". Metacritic. CBS Interactive. Retrieved 18 March 2019. ^ Wise, Damon (24 January 2009). "Moon at the Sundance Film Festival". The Times. London. Retrieved 19 March 2019. ^ Byrge, Duane (25 January 2009). "Film Review: Moon". The Hollywood Reporter. Retrieved 19 March 2019. ^ Ebert, Roger (17 June 2009). "Moon". Chicago Sun-Times. Retrieved 19 March 2019. ^ White, James. "10 Egregious Oscar Snubs". Empire. Archived from the original on 25 September 2015. Retrieved 19 March 2019. ^ Weingarten, Christopher R.; Murray, Noel; Scherer, Jenna; Grierson, Tim; Montgomery, James; Fear, David; Marchese, David; Grow, Kory; Tallerico, Brian (22 August 2017). "The Top 40 Sci-Fi Movies of the 21st Century". Rolling Stone. Retrieved 19 March 2019. ^ Simon, Reynolds (2 May 2015). "9 incredible low-budget science fiction movies: Moon, Monsters, Primer". Digital Spy. Retrieved 19 March 2019. ^ Flynn, Gaynor (24 January 2009). "Brits in the thick of it at Sundance". The Independent. London. Retrieved 19 March 2019. ^ a b McCarthy, Erin (1 October 2009). "Questions for Duncan Jones, Director of the Film Moon (With Video!)". Popular Mechanics. Retrieved 19 March 2019. ^ Rettner, Rachael (1 October 2013). "Top Brain Science Movies Revealed". Live Science. Retrieved 19 March 2019. ^ "Film Awards Winners in 2010". British Academy of Film and Television Arts. 21 February 2010. Retrieved 19 March 2019. ^ "Nominations 2009 : BIFA". The Moët British Independent Film Awards. Retrieved 19 March 2019. ^ "2009 Chicago Film Critics Awards". Chicago Film Critics Association. Archived from the original on 23 December 2016. Retrieved 19 March 2019. ^ Child, Ben (29 June 2009). "Moon shines as best British film at Edinburgh". theguardian.com. Guardian Media Group. Retrieved 19 March 2019. ^ Reynolds, Simon (25 February 2010). "In Full: Empire Awards 2010 nominees". Digital Spy. Retrieved 19 March 2019. ^ "21st Espoo Ciné International Film Festival 20-29 August 2010". Espoo Ciné International Film Festival. Retrieved 19 March 2019. ^ "Bond Girl Eva Green to present top Evening Standard movie award". London Evening Standard. 5 February 2010. Retrieved 19 March 2019. ^ "Gerardmer Fantasy Film Festival 2010". Le public système cinéma. Archived from the original on 7 November 2013. Retrieved 19 March 2019. ^ "Nominated - II Gaudí Awards". Gaudí Awards. Retrieved 19 March 2019. ^ Wallace, Lewis (5 September 2010). "Moon Lands Hugo Award for Best Sci-Fi Movie". Wired. Condé Nast Publishing. Retrieved 19 March 2019. ^ "Sam Rockwell | Spirit Awards 2014". Independent Spirit Awards. Archived from the original on 14 November 2013. Retrieved 19 March 2019. ^ Nemiroff, Perri (21 December 2009). "The London Film Critics' Circle Awards Quentin Tarantino Their Top Honor". Cinema Blend. Retrieved 19 March 2019. ^ "Colin Firth named best British actor by 30th annual London Film Critics' Circle Awards". 19 February 2010. Retrieved 19 March 2019. ^ Karger, Dave (3 December 2009). "'Up in the Air' wins National Board of Review". Entertainment Weekly. Time Warner. Retrieved 19 March 2019. ^ "Phoenix Film Society Names "Inglourious Basterds" Top Film of 2009". Phoenix Film Critics Society. Archived from the original on 24 August 2011. Retrieved 19 March 2019. ^ Pacheco, Jared (20 February 2010). "Nominees for 36th annual Saturn Awards! Moon, Zombieland & More!". Arrow in the Head. JoBlo.com. Retrieved 19 March 2019. ^ Knegt, Peter (15 June 2009). "25 Days Later, "Dynamite" and "Cove" Tops With Seattle Audiences". IndieWire. Snagfilms. Retrieved 19 March 2019. ^ "Sitges Film Festival". Sitges Film Festival. 11 October 2009. Retrieved 19 March 2019. ^ "Writers' Guild Award winners". Writers' Guild of Great Britain. 22 November 2010. Archived from the original on 4 May 2014. Retrieved 19 March 2019. ^ "Sam Rockwell Will Have A Cameo In Moons Quasi-Sequel". SFX. 12 December 2009. Retrieved 19 March 2019.